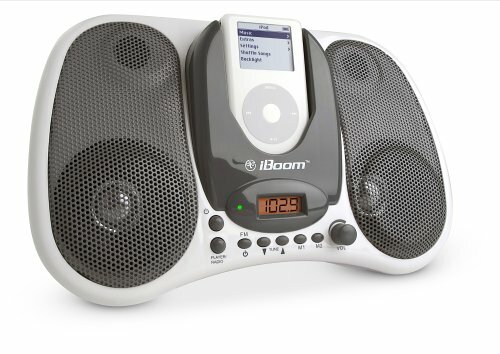 Apple chief executive Steve Jobs has unveiled a new iPod Hi-Fi boombox that allows users to play songs on their iPod portable music players in a living room or study. "It's home stereo reinvented for the iPod age," Jobs said at a company event at Apple's corporate headquarters in Cupertino, California. The $349 device is comparable to competing appliances from high end manufacturers like Denon and Bose but costs significantly less, Jobs touted. The iPod Hi-Fi features a universal iPod plug that allows users to plug in their iPod or iPod Nano music players directly into the top of the device and comes with a remote control. The remote is the same as the remote control that Apple is already shipping with its iMac computers. 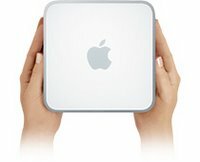 The Apple chief executive also presented two new Mac Mini models that are powered by an Intel processor and those computers too now come equipped with Apple's remote control and Frontrow. The Frontrow application presents users with a graphical interface that lets them directly access their music, video and photos with the remote control rather than through the use of a keyboard and mouse. Frontrow furthermore has been equipped with support for the Bonjour networking technology that allows devices on a network to detect each other and connect. The addition is the missing link in building home networks in which users can stream photo's, music or movies throughout their homes and play it on any television or computer in their homes. "It allows devices to find themselves automatically over a network and communicate with each other without any configuration or settings. If you have Bonjour running on your Macs or PCs [with iTunes], they can find each all throughout your house," Jobs said. A Mac Mini powered by a single core Intel processor sells at $499 and a dual core model is available for $799 as of today. Jobs cited benchmark tests for the new dual core Mac Mini that showed a 550 per cent speed increase. But if the experiences with the new Intel powered Mac Book pro laptop computers are provide any guidance, users will see a far less impressive speed boost with everyday applications. At the introduction of the new laptops last January, Jobs cited a 200 to 300 per cent speed gain based on benchmarks. But tests using regular applications demonstrated a performance increase of only 20 to 30 per cent. Photos of the unveiling and products are available on the Silicon Valley Sleuth blog for the Mac Mini and the iPod Hi-Fi.